Woo hoo for 1400 followers; time for a FREEBIE to help celebrate! 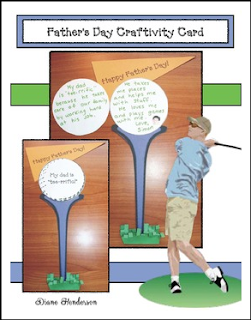 Here's a quick, easy & fun card children can make for their father to help celebrate his special day. Younger kiddos can simply make the "My dad is 'tee-rrific!'" 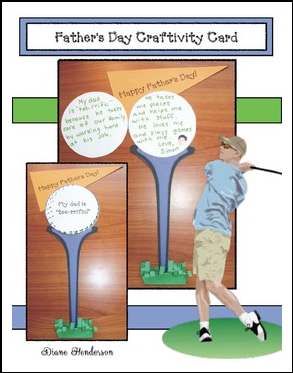 craft, while older students can "hinge" the golf ball to make a card with a writing prompt of why their dad is terrific. I've also included patterns where students can fill in the blank with grandpa or another significant person, in case they don't have a dad. I'm Diane from Teach With Me, hoping you find this Father's Day craft useful. A special "Thank you!" shout out to all of my fan-tabulous followers. I'm thrilled that you enjoy my products, and happily humbled that you follow me. I promise to post at least one "Flash" freebie each month, as well as milestone freebies like this one, as we enjoy growing together. For more End Of The Year activities click the link. Come join the fun on Facebook for my exclusive FREEBIES & Monthly Giveaways. Check out my educational Pinterest boards.